Round House is a large seven-bedroom villa that gives its guests the feeling that they are modern royalty almost as soon as they arrive. Maybe it’s the castle-like stone walls, the cathedral ceilings, and the rounded and spiral staircases found throughout, but one stay here and you feel like you rule the island. Each bedroom (six with king beds and one with two twins) features an en-suite bathroom, complete with Italian marble, and the master bedroom shows off awesome views of the ocean and golf course. See the sights as you lounge out by the pool or out on the dining terrace. The villa comes fully staffed and includes a cook, so meals are nothing to worry about. You can golf cart down to the water and enjoy plenty of time by the beach, and Tryall Club also has golf and tennis. 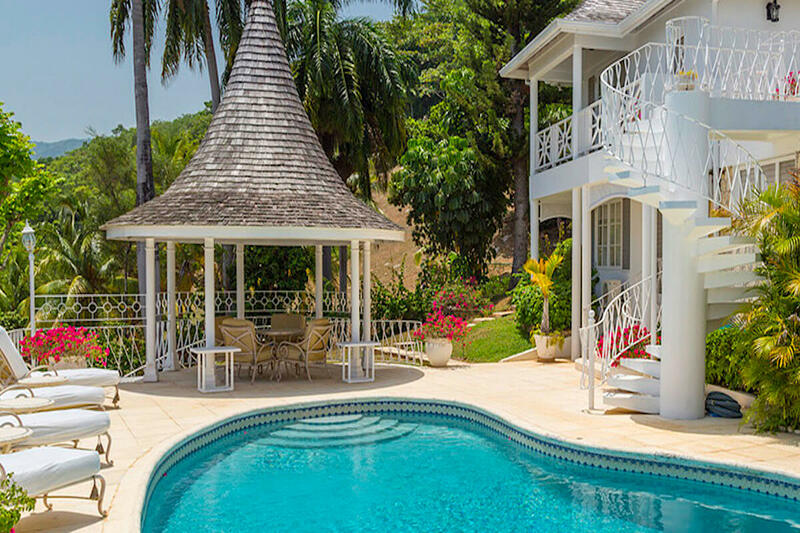 Round House is a seven-bedroom villa and is one of the largest and most spacious villas at The Tryall Club. It is arresting both in its design and superb location. Split into two levels, its cool interior spaces are elegantly decorated with personal taste and have all the atmosphere and comforts of a private island home. Round House bedrooms are beautifully decorated, all with lofty cathedral ceilings, fans and air-conditioning. Round House has six king beds and two twin beds spread out in various bedrooms. The master bedroom has a fantastic panoramic view of the ocean and golf course. The villa is updated with modern bathrooms/showers from beautifully selected Italian marble. In the airy living room there is a television for group entertainment. The action of the day and night unfolds around the outdoor open-sided cathedral ceiling dining gazebo and semi-circular terrace that looks down on the manicured gardens encircling the pool and deck. Beyond the pool railing, the view opens up to a breathtaking panorama, which provides sweeping views of the ocean and golf course. Round House comes with a staff of six, whose warm and professional demeanor is welcoming and causes every visitor to feel very special, whether you are a family with children or a group of adults. The staff consists of a butler, cook, maid, laundress and pair of gardeners.